Protect yourself and your family with this information and safety tips. Who Is Most Sensitive to Smoke? Even healthy people can experience these symptoms or health problems when smoke levels are high. If symptoms are serious, call 9-1-1 for emergency assistance. Check local air quality reports and listen to news or health warnings for your community. 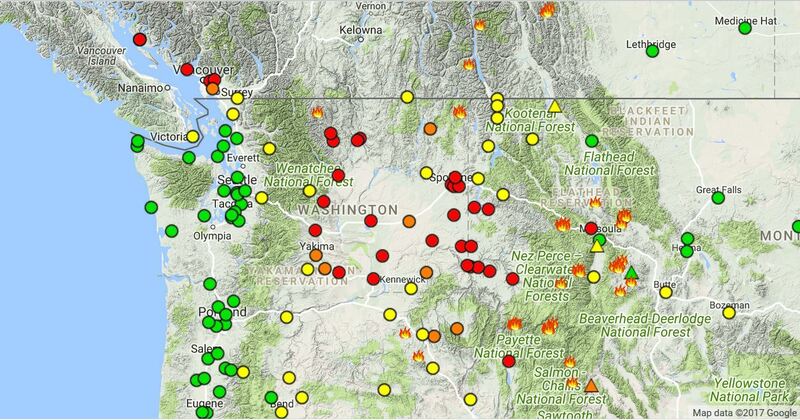 Check the Washington Smoke Information blog here, visit their air quality map here or the state air quality website here. Avoid physical exertion outdoors (e.g., exercise, swimming, hiking, mowing the lawn, playing outdoors) if smoke is present and/or air quality is categorized as unhealthy, very unhealthy or hazardous. People with asthma and lung and heart conditions may be extra sensitive and may experience symptoms when air quality is categorized as moderate. Avoid driving if possible. If you must drive, keep the windows and vents closed. Most vehicles can re-circulate inside air rather than drawing in outside air. If you have asthma or other lung diseases, follow your doctor’s instructions on taking medications and following your plan of care. Call your health provider if your symptoms get worth. Keep windows and doors closed. If you don’t have air conditioning and it is too hot to keep them closed, consider leaving the area until the danger has passed. If you must be outside, consider wearing a face mask or a respirator mask labeled N95 or N100. Face masks will not work for everyone. Learn more about smoke and face masks here. Run an air conditioner, set it to re-circulation and close the fresh-air intake. Make sure to change the filter regularly. Use a high-efficiency particulate air (HEPA) filter to reduce indoor air pollution. Don’t add to indoor pollution with candles, fireplaces or gas stoves. Don’t vacuum which can stir up particles already in your home. Don’t smoke which adds to the pollution. Some room air cleaners can help remove smoke particles indoors. Get more information about keeping indoor air free of smoke here.